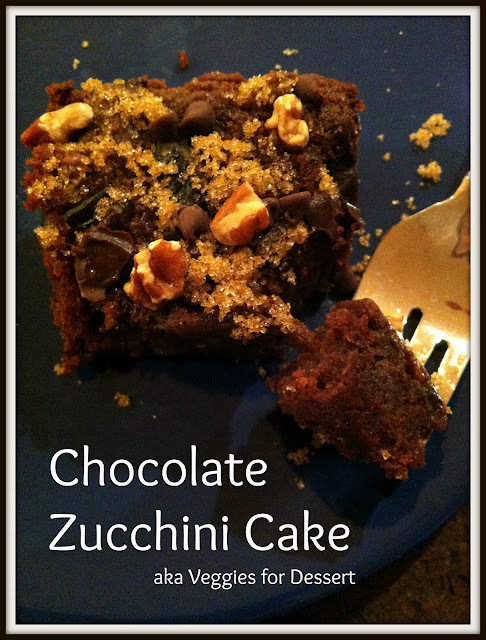 Before I share my recipe of chocolate zucchini cake for this Friday's installment of "Here, Taste This," I have to tell you a story. Last week, I accidentally made this cake with tofu. And it was awesome. It was all because I grated half a giant zucchini a friend gave me ('tis the season where grown-ups ding dong ditch with overgrown produce) before realizing I was out of eggs. I cannot abide a trip to the grocery store to buy just one item, so I turned to Google. Did you know tofu is an acceptable substitute for eggs in most baked goods? I did not, probably because I rarely have tofu sitting around. But I bought a chunk (square? brick? hunk?) of tofu at Trader Joe's earlier this summer, intending to sneak it into some smoothies. And then I totally forgot to use it. So when I read that I could both bake my cake and get rid of use the tofu that was giving me the stink eye from the back of the garage fridge, I jumped at the chance. The process was simple: 1/4 cup of pureed tofu equals 1 egg. I cut the tofu into chunks, threw them in the food processor, gave it a good whirl and added the resulting goo to my recipe at the appropriate time for eggs. The cake didn't suffer for it. In fact, it might have been even more deliciously dense. Plus: extra protein. Between the tofu and the zucchini, this cake is practically health food. Eat it for breakfast and start your day off right. Cream butter, oil and sugar until mixture is light and fluffy. Stir in eggs, vanilla and sour cream until well blended. Combine all dry ingredients. Add slowly to batter and mix until blended. Smooth into greased 9x13 cake pan. Bake at 350 for 35-40 minutes. The cake will be dense and moist but will spring back slightly when touched in the middle. 1. You can substitute margarine for the butter. But why would you want to? 2. I have taken to using plain Greek yogurt in almost all my dishes that call for sour cream. I can't tell the difference. 3. I often add a tad more than 2 cups of zucchini to the cake, owing to the fact that I'm trying to use up all the monster zucchini I've been gifted. But don't overdo it, or your cake will never cook. Not that I've ever done that or anything, cough. 4. Feel free to use your discretion with the toppings. If you don't like nuts, leave them off. If you'd rather not have so much chocolate, then use fewer chocolate chips. 5. Be wary of using regular brown sugar as a topping. It has a tendency to melt into the cake during baking, making the resulting dish almost too sweet. The brown sugar I've been using lately (Trader Joe's organic) has large sugar crystals, which keeps this from happening. 6. Store this cake in the fridge, lest it get bubbly. I had a big ole zucchini in my fridge too, and now your cake is in my oven. Mmm...I'm eager for the next 30 minutes to go by fast! Mind if I come over? I'm down to one piece.